GN Focus: Does God Know What You Will Do Tomorrow? God knows everything — right? So God must know what you are going to do tomorrow, and the next day, and the next — right? God is certainly all-wise and all-knowing. He knows everything there is to know about you. He knows what you are doing now and what you did yesterday. He even knows how many hairs you have on your head (Matthew 10:30). But He doesn't know what you're going to do tomorrow. He doesn't know that because it hasn't been decided yet. And God does not decide it. You do. A lot of people don't understand this. They have an almost fatalistic superstitious belief that their future is all mapped out. Some even believe that they have been predestined to be saved while others are inevitably predestined to be lost! They have, unfortunately, totally misunderstood the scriptures on the subject of predestination. We have a free booklet entitled Predestination - Does the Bible Teach It? that explains those scriptures thoroughly, and we would be pleased to send it to you if you would like it. We won't go into that aspect of predestination in this article, since most people do not believe in fate so strongly as to believe that their eventual salvation or damnation is predetermined. But many do wonder if God has to some extent plotted the future course of their lives, and if it is therefore beyond their control. Scriptures such as James 4:13-15 and Luke 12:16-20 seem to indicate that God has already decided what is going to happen to us tomorrow, and that there is no point in our making plans. If good things happen, that is God's will. And if bad things take place? Well, that was also "meant to happen." The Bible certainly does show that God is able to decide what happens in the future, and reserves the right to override any individual's plans. He has intervened often in the course of events. He has had to make sure that the right people are in the right place at the right time in order that some aspect of His master plan can be fulfilled. But this is not His usual way, and it is probably not going to be your experience. Most of us have not been called for special individual missions or to perform earth-shattering miracles. We are ordinary people whose minds have been opened to the truth of God. In that sense God has intervened in your life. And if He has, it has a lot to do with the topic we are discussing. The fact that you have an interest and understand is evidence that God is drawing you to Him, and that you are a part of His plan now. But if that plan is to succeed, God cannot plot every move of your life from now on. So He doesn't know what you're going to do tomorrow. But He would like to know. 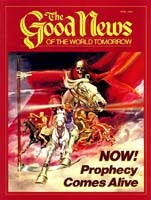 Many readers of this magazine may be understanding the truth and the plan of God for the first time in their lives. They are finding a new interest in the Bible. Their minds are becoming filled with new knowledge. Perhaps they are beginning to obey the laws and commandments of God more diligently than ever before. Maybe they have even begun to pray regularly for the first time. Does that describe you? If so, you can thank God for it. He has begun to open your mind. You could not have opened it for yourself, however open-minded you might claim to be (I Corinthians 2:11-12, 14). Understanding requires the working of the Spirit of God, if even the best brain is to really get the point. Contrary to what many have been taught, God is not trying to save this world now. He is opening the minds of only a very few. Jesus knew this, so He was not frustrated by His apparent lack of success during His earthly ministry 2,000 years ago. He did not try to save the world then, and He is not worried about the lack of knowledge of Christianity in the world of today. If you have not already read it, be sure to write for our free article "Is This the Only Day of Salvation?" That doesn't mean, of course, that Jesus Christ doesn't care about the people of this world. He loves them and He died for them. And one day they will feature greatly in His plans for all the human race. But Jesus knows and accepts what He once explained to His critics, "No one can come to Me unless the Father who sent Me draws him" (John 6:44). If God the Father has decided not to call them yet, Christ abides by that decision. Let them live out their lives. Their time will come. But you may be different. If this magazine is beginning to make sense to you, and if the words of the Bible are starting to come to life, and if you are beginning to act on what you know, then God is calling you. And if you are one who is able to come to Christ because God has drawn you, you can be certain that He is very concerned about what you do now and in the future. Jesus Christ takes seriously the responsibility of being a good shepherd to God's people. He strives not to lose even one person that the Father has drawn to Him (John 10:27-29, 17:12). So you can be sure that He is watching over every aspect of your life carefully. You may be giving Him some anxious moments. That's why He would like to know what you are going to do tomorrow. He has, of course, a fairly good idea. Human beings are predictable. Tomorrow you probably are going to perform your normal workday or weekend routine. You'll face usual circumstances in your usual way. It will be an average sort of day, and you are probably going to spend it doing ordinary things like going to work, cleaning the house, studying, watching television. You'll probably go to bed much the same person you were when you got up. And that may be the problem. What you are going to do tomorrow might be causing God some anxiety. God must get to know His people, just as they must get to know Him. One day soon He's going to change them from mortal to immortal so that they may live forever in the Kingdom of God. God will give them important responsibilities with power and authority over others. But first He must know what they will do with that power. Will they use it, as Christ does, to serve and do good? Or like Satan, a great immortal being who became perverted and now uses his great powers only to steal, kill and destroy (John 10:10)? God must know. He must be able to predict what we are going to do and how we are going to act once we have been given eternal life. The basis of that prediction is what we do now in this life. God has got to know you. He must know the kind of decisions you will make concerning right and wrong. He's given you freedom of choice since He wants His sons and daughters to choose to obey Him, even in the face of any and all opposition. God must allow us that freedom of choice. Otherwise the Kingdom would be full of preprogramed, obedient automatons, but not lively sons and daughters who can share the joys of eternal life with Him. "Therefore by their fruits you will know them," said Jesus (Matthew 7:20). Your fruits — what you do – show where you are spiritually. Perhaps before you came to understand the way you should live, those fruits weren't too good. But now you are trying to change. Or at least you say you are. But are you? God needs to know. You may have very good intentions to start to pray regularly, to keep your temper, to stop using bad language, to keep the Sabbath holy or whatever it is. You mean well, but it may be like the diet that you're always going to start tomorrow. Tomorrow never comes. On the other hand, if you have been diligent and begun to practice the ways of God in your life, then you will probably keep doing so tomorrow. And the longer you have been doing it, the more predictable you will be. In your case God knows that most likely tomorrow will find you obeying Him once again. But you don't have to. You are still a free moral agent with the power of choice. Some people have given up after years of living a Christian life. It is unlikely that you will throw it all away tomorrow, but it could happen if you decide to do it. So based on what you have done so far with the knowledge you have been given, God has a good idea about what you will do tomorrow — good or bad. But you could surprise Him!